Slash Your Winter Heating Bills - 17 Ways to Save Money This Winter! Home / Money Management / Saving Money / Slash Your Winter Heating Bills – 17 Free & Inexpensive Ways to Save Money This Winter! I love the Fall. The leaves change color, the weather turns cool and crisp, and the holidays bring families together. But fall also means that winter is just around the corner – and rising energy costs are sure to make this an expensive winter unless you do something to reduce your heating bills. These tips will help you save money and resources while staying warm this winter. We’ve combined these tips into two sections, the first includes 10 free tips. The next 7 tips are all low-cost ways to save on your energy usage. 1. Use a lower thermostat setting. You will save up to 3 percent on your heating bill per degree lowered over a 24 hour period (or about 1 percent per 8 hours). During the winter months, we keep our thermostat set at 68 during the day and 55 at night. Lowering the thermostat to 55 degrees while we sleep saves us about 13% on our heating bill. During the rest of the day, we wear warm clothing such as a sweater, long pants, and thick socks or slippers to keep warm. 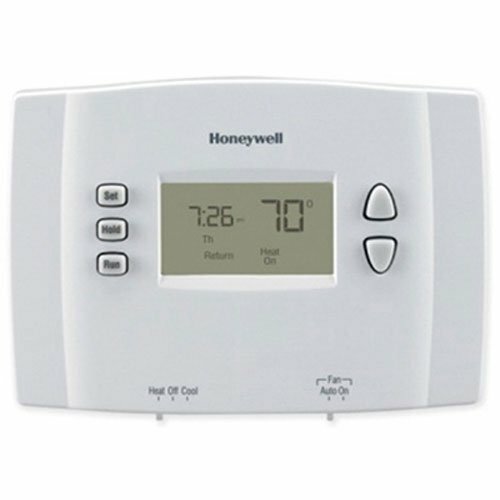 We use a programmable thermostat to make temperature regulation easier and to save money. 2. Seal your chimney flue when not in use. Leaving your chimney flue open when not in use is the same thing as opening your window several inches. You will allow a large quantity of warm air out of your house, and a large quantity of cold air in. You should also make sure your dryer vent closes properly as well. 3. Use fans to circulate air. Set your fan on low to circulate air upward toward the ceiling. This will force the warmer air that rises and gets trapped at the ceiling downward, leaving your house feeling warmer. 4. Keep vents and radiators clear. Ensure your vents are not blocked by rugs or furniture, or that you don’t have any large objects in front of your radiator. This allows the air to circulate freely and you to get the full benefit of the warm air and put less strain on your furnace. This is also safer! 5. Clean vents, radiators, etc. Not only is dust an allergen, but it is also a wonderful insulator. Clean the built-up dust from your radiators and baseboard heat vents often. This allows the air to flow freely into your rooms and promotes equal heat radiation. It is healthier too! 6. Pay attention to your windows. Approximately 10-25% of your house’s heat loss can be attributed to windows. To reduce this, open curtains and shades on south-facing windows during daylight hours to allow the sun’s heat to enter your house and warm it. Keep curtains and blinds closed at night and when the sun is not shining on them to insulate your house and keep the heat inside. Another tip – place blankets over uncovered windows and drapes, especially at night when the windows are not being used and the temperature is at its coldest. 7. Shut the doors. If the room is not used, why heat it? Shut the doors and close the vent when you are not in the room. When you are in the room, shutting the door can increase the room’s temperature by keeping in your body heat and the heat produced by lights or other electronics such as a computer. 1. Use a programmable thermostat. A programmable thermostat can help you save 10-20% on your energy bill year round. Program your heater to come on right before you wake up, cool down when you leave for work, warm up when you return from work, and go down again right before you go to bed. How much will it save you? You can save 1% off your heating bill for every degree you lower your thermostat over an 8 hour period. Many people can save enough money with their first month’s use to pay for the thermostat. Cost: $20 and up. Savings: 10-20% of your monthly energy bill. 2. Change air filters. Clean air filters permit a better flow of air through your heating system, allowing hot air to more easily flow through the vents and into your rooms. You also reduce the strain on your furnace, which can extend its life. Change your air filter monthly, or whenever it is dirty. Bonus benefit – cleaner, healthier air! Cost: $2-10. 3. Seal the leaks in your house. Your house leaks hot air! But if you seal most of these leaks, you can save between 10-20% on your heating bill this winter. To detect leaks, wait until it is cold outside; you will probably need at least a 30-degree difference in the indoor/outdoor temperatures to notice the difference. Common areas to find leaks include around doors, windows, near the attic, where wires and cables enter your house, and around electrical outlets. Seal gaps around any pipes, wires, vents or other openings with caulk or weather stripping. Cost: $5 and up. Savings: 10-20% of your heating bill. 4. Add insulation to your house. Insulation helps keep the hot air in and the cold air out. This can not only save you money, but it can also be a tax-deductible home improvement which will give you an even better return for your investment! Basement insulation is often overlooked and will help keep your house warmer during winter months. Cost: Depends on how much and which type of insulation. Savings: Depends on how much and which type of insulation and whether or not it is tax deductible. 5. Seal heating ducts. – Most ducts have small leaks that allow your heated air to slowly escape. You can prevent this with a roll of metallic tape for about $10 (don’t use duct tape – it degrades over time!). You can also use a liquid or aerosol-based sealant, which sometimes works better than tape, but is messier. Pay special attention to sections of ducting with kinks, bends, breaks, and disconnections. Cost: $10 and up. 6. Insulate heating ducts: You can lose up to 60% of your heated air before it reaches the outlet if you have non-insulated ducts that travel through unheated spaces such as the attic or basement. Special duct insulation can help you retain heat and energy and save a lot of money over the long term. This is a great idea if you will be living in your house for a few years. Cost: $10 and up. Savings: 10% of your energy bill or more. 8. Humidifiers. Using a humidifier can reduce your heating costs because moist air retains heat better than dry air. There are other benefits to using a humidifier as well: they reduce static electricity (and annoying winter time shocks! ), dry skin, and make it easier to breathe. Cost: $30 and up. 9. Air Vent Booster. An air-vent booster is a fan you install over your vent that works by drawing additional air into a room that is always way too hot or cold. I recently installed one in our “problem room,” and the results have been quite good. It helps lower our utility bills and saves a large amount of energy. The model I have is the AirFlow Breeze, which costs about $50. Cost: $40 and up. 10. Install plastic window treatments. Installing heavy duty clear plastic window treatments can reduce the amount of heat loss through your windows. This is a great idea if your windows are single pane windows. You can save up to 10% of your heating costs by installing these. Cost: $5 and up. Of course, if you do all of these, you won’t be able to reduce your heating bill to nothing! There is a law of diminishing returns that must come into play somewhere. But, most of these are inexpensive and easy enough for just about anyone to do. Not only do they save a lot of money, but they reduce your energy usage which is great for the environment. Also, if you have central air or a ceiling fan consider turning on the fan (not the heat) briefly. The energy usage of the fan is offset by the fact that it “stirs” the air and keeps it more uniformly mild, instead of letting all the hot air rise and the cold air settle. Point taken on having kids. You definitely want to look after them! I didn’t think about turning on the fan briefly, but that is a good idea. It would also push out the rest of the hot air that was trapped in the ducts when the furnace shut down. Great tips! This one probably does not apply to just winter, but adding an insulating blanket to your water heater can save some money. They are typically located in cold and damp basements so any type of covering can help. We have just had our cavity wall insulated and extra insulation placed in the loft. Its made a huge difference the house is much warmer and the heat seems to stays in the house for much longer, when the heating has been turned off. I have not considered some of your ten points though so thanks will try them. Similar to people are starting to get themself smaller and fuel efficient vehicles or start taking busses whenever possible, moving to an apartment with integrated heating system or moving to smaller house with less & smaller rooms can also be breakthrough idea for saving. Turning your heat down more than 3 degrees from the daytime set temp will actually cause you to loose efficiency if you have a heat pump. Biggest and eaisiest way to save on heating bill – change your filter every 3 months. I have a power vent gas hot water heater. I recently put a timer (15 amp) on the power vent to keep it turned off from 9p until 430a. I spoke to a plumber who advised that is is okay because the unit needs the power vent operating before any gas flows or the unit becomes active. In addition I have the tank and pipes all insulated to help keep the heat longer inside. Finally, I turned the temperature of the heater down to the 115 degree range. Joseph, how did you connect the timer? Did you use a commercially available plug-though timer or did you have to hard-wire it? Thanks for the great tips (and this blog)! We think air vent boosters are GREAT!